A Mom & Pop New Car Store! Tom Whiteside Auto Sales, Your Smartest Decision. After 58 Years, We're Still a Mom & Pop Store! We are the oldest Jeep Dealership in Central Ohio and the smallest new car store around. We have no desire to be anything else, we just want to give good sales and repair service to every customer while making it a great place for us to work. We sell new Chrysler, Dodge, Jeep and Ram vehicles, and all makes of used. Because There are so many rebates that are unique to each customer (do you have a trade, where do you work, are you going to finance with Chrysler Capital, are you currently leasing, etc. ), that will effect the amount of savings available, we mainly put list prices on our website, this is better than putting fake prices on the internet to get you to our store and then explain what fine print you failed to read. We will get you the best of everything, including the buying experience. The list price is the best price to use when you are comparing equipment levels, every vehicle with the same equipment will have the same list regardless of what dealership has the vehicle. Using the list price is the best way to make sure you are comparing apples to apples. Call us 800-686-2818. 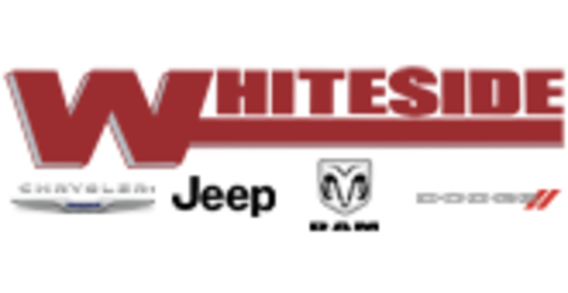 Tom Whiteside Auto Sales has been in business since 1960, we keep a good selection of new and used vehicles in stock, we can usually find a new car or truck on our national locator if we don't have the right one in stock. We encourage our customers to special order their vehicle, get the equipment and color you want, without any extras you don't want to pay for. We sell a lot of cars and trucks in the Columbus and Grove City area because we make the buying process transparent, quick, and at an overall lower price. In addition to our cars for sale and trucks for sale, we offer financing, parts, leasing, and have a state of the art service facility and a full body shop. Our body shop repairs and repaints everything from a golf cart to the biggest semi.